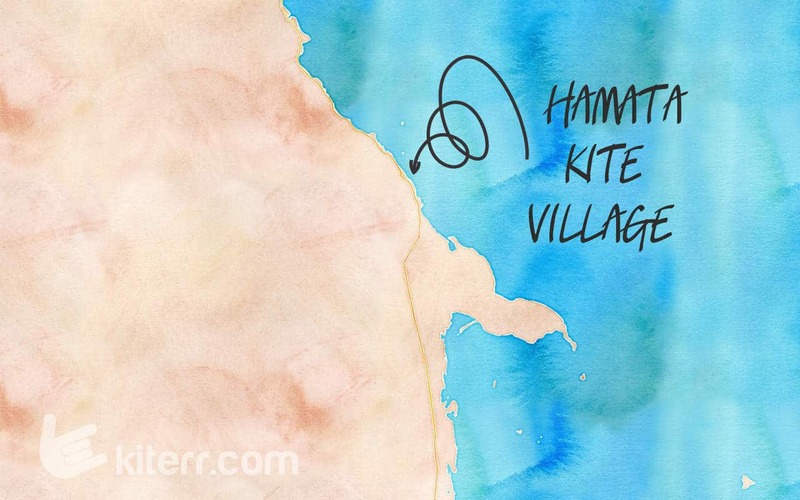 If you're thinking of Hamata for your next kiteboarding trip, you're in for a real treat. Hamata stays proudly amongst the best kiteboarding spots in Africa. Located on the coast of the Red Sea, Hamata is a wonderful beach in Egypt and one of the most popular kitespots in Africa. It is just so different from other popular kiteboarding spots all over the world in many ways. Hamata combines crystal-clear waters, green forests (unlike the vast majority of Egyptian beaches), three fascinating islands with reefs, good kiting facilities and a wide area, ideal for the kitesurfing lessons and practice for more experienced kiters. Try to get out and go kiting over the islands. You will feel like flying over an aquarium, seeing all the life in the reef below you. You will find exactly what you chase: an awesome reef and coastline and some of the strongest winds blowing in Egypt. Winds are present in Hamata all year round. If you prefer to find the strongest wind and at the same time avoid hot summer temperatures, the best period to choose is the first part of the year (January to June), as well as months between October and December. The wind starts blowing stronger in the morning slowing down a little going into the afternoon. All types of kites can prove pretty useful, smaller for stronger winds, keeping the bigger ones for days when the speed decreases. A wetsuit is necessary for months between January – March and October – December, the water temperature drops down significantly, but for the rest of the year, you’ll be alright. For the local kitespots, Hamata has only one, but a really big one, almost endless space with crystal clear water with always enough space for everybody. The spot is just a gem for the kitesurfing lessons or practicing beginners. The water is flat with no waves although it could get choppy sometimes with the wind, but in general, it is a pretty smooth ride with water depth only about up to your waist if not the knee and pretty consistent cross on-shore winds. You can reach Hamata by air. There are several flights from Europe landing at the airport of the city of Marsa Alam. If you are planning your kitesurfing holidays in Hamata, it would be a good idea to get your airport transfer organised beforehand. There are several options at the airport, but you know how it works. You usually end up paying 3 times more than normally thinking you cracked a hell of a deal. Marsa Alam is the closest airport to Hamata, about 180km away, so that’s about 2 and a half hours on minibus. Check with your hotel if they can organise airport transfers for you. No Wind? Stand-up paddle or diving might be an alternative. If you choose to have a break from kiting, the area is also famous for diving and snorkeling, especially on no wind, no ride days. If you feel like doing something different, an exploration trip on SUP board or diving in the area would be an interesting idea. Food is a combination of European flavours with a touch of Arabic and Egyptian cuisine. Local hotels usually do their best at mixing spices with typical dishes of the Old Continent and making them more exciting and exotic. You can also find traditional cafes with an atmosphere from another world and stay there, as there is absolutely no nightlife in Hamata. What next? How about Zanzibar? Checkout this guide to some of the best kiteboarding spots that Zanzibar has to offer.